Monica A. Coleman is an award-winning scholar, writer and minister. A sought-after speaker and consultant, Dr. Coleman is committed to connecting faith and social justice. Whether in the classroom, the pulpit, the conference room or in her blog and books, Dr. Coleman combines expertise with experience to offer models for practicing faith in the midst of a complex hurting world. Dr. Coleman offers workshops, lectures and sermons for your organization, university or church. She warmly connects with people as she shares principles for growth and liberation. Watch this video to learn more. In gripping fashion, Coleman examines the ways that the legacies of slavery, war, sharecropping, poverty and alcoholism mask a family history of mental illness. Monica A. Coleman shares her life-long dance with trauma, depression and the threat of death. 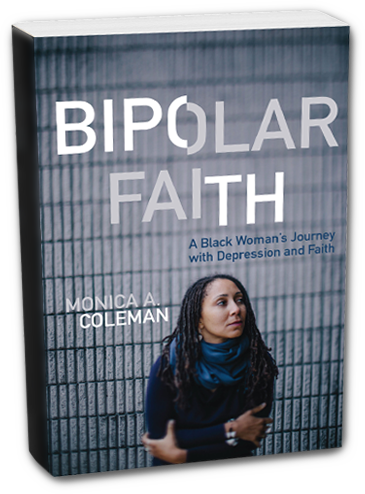 Only as she was able to face her illness was she able to live faithfully with bipolar. And in the process, she discovered a new and liberation vision of God.